Ill be posting a story here in a bit about my 2013 Goat season here in Hawaii (Big Island) Here are some video stills from our short goat season. Hope you enjoy!!! Don't have too much time to write a full in depth story but here is the short hand version. As the sun broke the horizon I was expecting some 100+ goats to be making their way up the bluff...but to my surprise, only one small billy was present. For the first time in a few years I seen more hunters than goats on opening day. As the morning went on we found a few more goats but none of them were in the correct spot that I could get 20 yards. As we were sitting under a silver oak, I began to peel my orange I picked the day earlier and then my dad noticed a billy working his way up to us, as I got ready the heart started to thump faster and faster. For the first time in a long time an animal got too close for comfort! Soon as I began my draw cycle the spotted the limbs moving and took off. WHAT A RUSH! To have a goat that close but no shot! As the day went on, we seen less and less goats. Usually in this area we see a few 100, but that day it totaled to about 50. The rest of the day was spent trying to find goats but we were pretty unsuccessful so we went to our tried and true spot, "the valley". Usually in this small valley there is some goats bedded or feeding. Well as luck would have it, we found about 15 goats, all were pretty young and probably only 2-3 years old but my freezer was getting empty so I figured if one gave me a good shot I would take it. I set up where they usually cross and before I knew it, we were surrounded by all of them, I picked out the first billy that came close and sent that arrow on its way. A nice thud and a grunt from the goat and I knew his time has come to an end. He ran about 20 yards and expired! It was a very tough hunt on opening day but still had a blast!! This hunt took place on August 28th, 2013. Soon Ill try to make a in depth story about my October 5th, 2013 hunt...and trust me you dont want to miss that one!!!! Awesome! Great pics! Nice one Riley! Can't wait to hear about the other story!!! Nice work looking forward to the rest of the season! Love that second pic with the blurred arrow. Those goats look like a lot of fun to hunt. Great pics man. Finally...one of the luckiest hunts I have been on. I was never a fan of that "I rather be lucky than good" but hey, I’ll take it any day!!!! I ordered a long bow a week or so before as I have been pondering the thought of shooting an actual “stick” for about 2 years. Luckily the bow came in the Wednesday before October 5th. I told myself if I can shoot well with it I would take it and see what would happen. As I practiced, and with my weird form, the arrows flew where I was looking. The Friday night before second weekend I told my dad, I’m taking the longbow!!!! My dads looked at me with a smirk and said don’t miss! I told him, ill just get closer. As Saturday morning came I was again expecting a ton of guys in the area that I wanted to go. We pulled into the area and to my surprise no one was there! Right at day break we left the truck and headed to the crossing again, this time 15 yards from the farthest trail and waited. It took the goats a little longer to come but they came. One by one, ten by ten. I didn’t want to end the hunt early and shoot a smaller Billy or a nanny at first light so I didn’t shoot as a hundred or so goats fed past us.After I was sure no goats were coming we headed to our little lookout spot to glass over the area. After 15 min of glassing we saw 2 goats; a nanny and her kid. Didn’t feel like shooting any one of those as they were pretty young and I didn’t need meat that badly. My father suggested we go up and follow the goats and try catch up to them and shoot an older nanny, I on the other hand wanted to walk more down and sit and wait in the tall grass for goats to come. I was torn on what to do but followed my gut and went to where; usually if pressured by other hunters they will feed up and back towards the hills. As we snuck to the spot I noticed more nannies eating. All were in the open and pretty hard to get 20 yards or less so I waited and just watched to see what would move into a spot so I could stalk. After about 20 min, the nannies fed off into the distance and then we decided to walk a little more in closer to the trail. Almost as I took my second step I noticed a back of a goat…it was feeding in the grass 30 yards in front of me. A really nice brown nanny is what popped into my mind and I dropped my pack and began the stalk to get into position. As soon as I got to 25 yards, I could see it coming out of the grass up the trail. The trail was about 18 yards away. I noticed that most of the goats were pretty spread apart so I started to give a few grunts and calls. The brown body that I thought was a big nanny was actually a really good Billy. At that point my heart started racing. I knew he looked right at me as I had no face mask on but he must have looked past me or something because he went back to feeding. 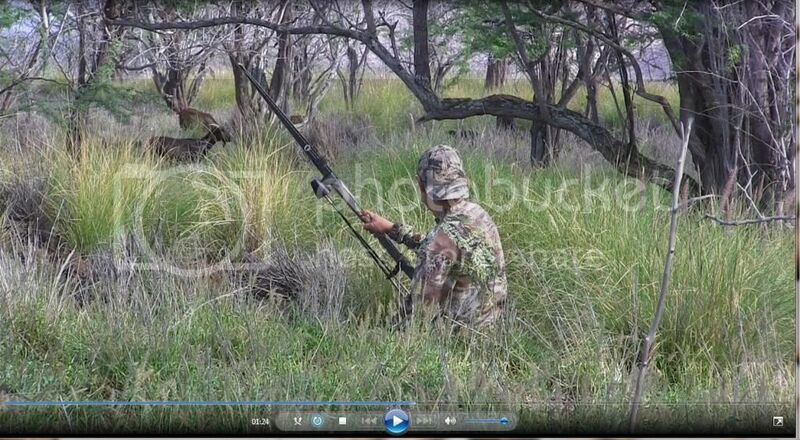 I slowly raised the bow and got into position, as I did he bedded down under a tree at 25 yards away. It was only 9:30 am so I knew he was taking a break, I then started to pull grass, mimicking how goats do when they eat and sure enough he stood right up and started to feed to me. He took 3 steps and then turned away at the sound of two younger Billys fighting so I picked a spot, and sent the arrow. 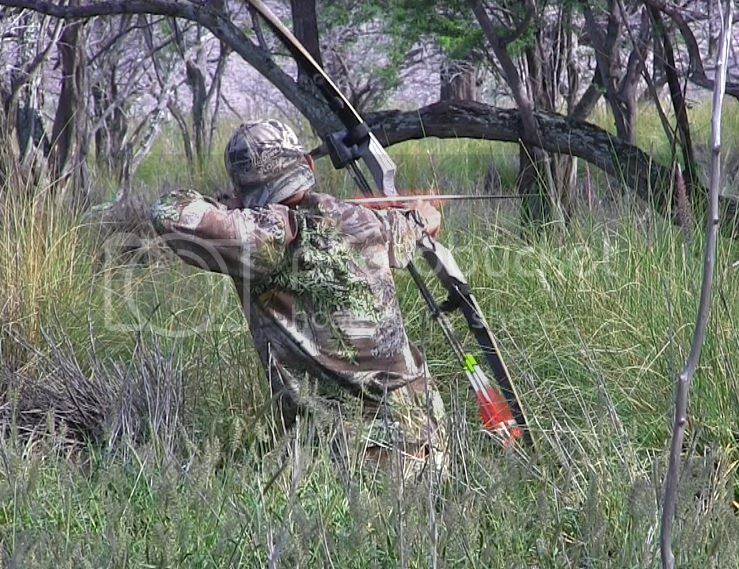 I was concentrating on the spot so much that I never even seen my arrow, all I could hear was the hit and the goat ran off. I looked back at my dad to see where I hit it and he couldn’t see from his point of view. The Billy ran in a little valley 20 yards away and bedded down; I crawled to the arrow and found that I made a bad shot. I wasn’t sure where but the arrow showed some gut on it. I was pretty bummed as I didn’t want to wound him and not find him so I began running scenarios through my head. Do I sneak up and let him have it again? Or do I just back out and let the arrow do the work? Till this day, I am still not sure if I made the correct but after 10 min, I decided to get close and get another shot on him. I took off the shoes and rolled up the pants and went in. I eased up, waited…eased up…waited. 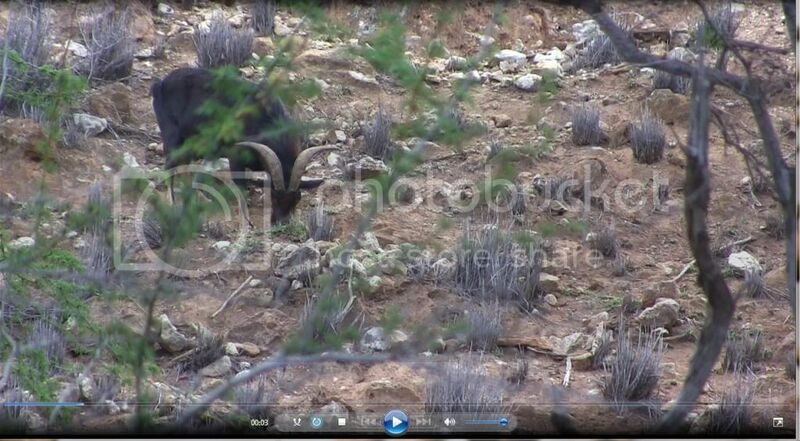 Knowing that I made a subpar shot I was looking for his horns or fur in the grass. I ended up getting 7 yards and found him bedded, I drew back picked a spot and sent the arrow. He stood up, looked around and fell right over! Perfect shot! I went back to my pack and my shoes and just smiled at my father and said, “Man, what a ride” So many emotions came into play on this hunt. We took pictures and field dressed him and headed out. Checked out by 12 and home by 2pm. What a great day!!! Awesome Riley! Especially for highly pressured public land!!! Well done dude. I hate it when I make a bad shot. Glad your story turned out well! Yeah public hunting sure isnt easy with the traditional gear but it sure is fun! I think bad shots are inevitable but we must do everything in our power to recover any animal. Im just very thankful that I got to find him quickly and put in that last shot. 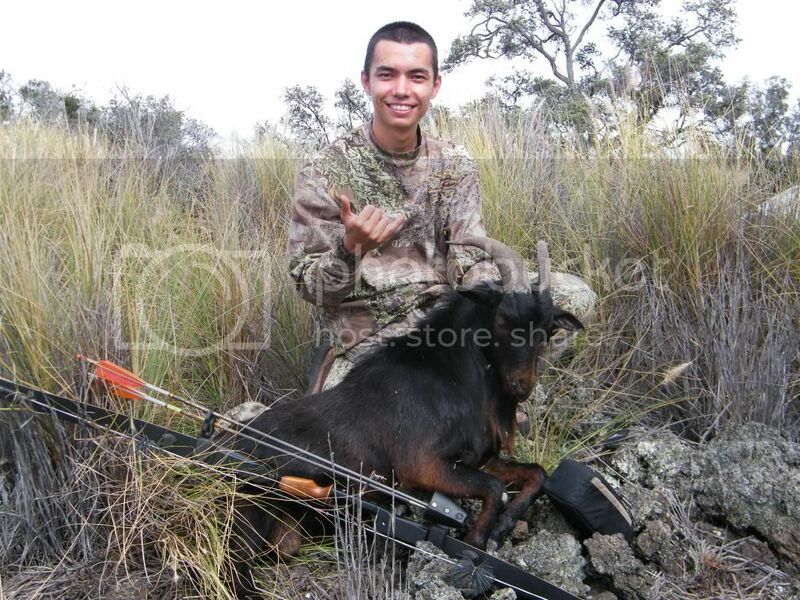 Nice goat Riley, I'll be chasing goats next time on da Big Island, soon I hope. I have a new bow that needs more experience! Im always here, unless im hunting the other islands let me know when your here! hey the more stickbow guys the better!!!!! Nice shot, nice billy! Can't wait till Makua opens again for archery. Wish we had game like on the outer islands.